Experience what it's like to be a Rock Star! 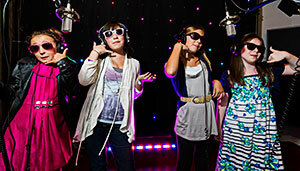 Sing, Record, Pose for Photos, and Party in a Professional Recording Studio. The Ultimate Party Experience for kids of all ages! Located on the Eastside of Seattle, near Bellevue, in Issaquah, WA, Eastside Recording Parties gives your kids the opportunity to record their favorite songs, have a Rock Star photo session, and Party like a Rock Star, all in a professional recording studio. "The Coolest Party Experience in the Seattle/Bellevue area!" Sing and Record your favorite songs with the same equipment the pros use. Record in a real, working studio, with award winning professional music producer & recording engineer Stephen Sherrard. Read more about the studio. Each Recording Party includes a Professional Photo Shoot with an award winning photographer! Cool lighting and props included! Check out the photos page for samples. The studio is all yours, and we provide you with a professional engineer & photographer to guide you through the recording process & photo session. We want your party to be very special! If you have special requests or want to customize a party to satisfy your Rock Star or Diva, just contact us and let us know . We will go over your request in detail and get back to you as soon as possible with a quote. At Eastside Recording Parties we treat you like a Star! "The Best Birthday Party Ever!" Incredible Rock Star Birthday Parties for Kids and Adults! At Eastside Recording Parties our specialty is Rock Star Birthday Parties for Kids & Adults! If you are in Issaquah, Bellevue, or the greater Seattle area, we can help you create the perfect birthday party for your little rock star, or the rock star in you! Copyright ©2019 DBAR Productions, LLC. All Rights Reserved.